The Dixie State University Trailblazers Competition Dance Team will take the stage to present its first-ever showcase this month. The showcase is set to take place at 7:30 p.m. on April 26 in the M.K. Cox Performing Arts Center on the Dixie State University campus. The dance team will perform a variety of routines that demonstrate a variety of styles, including hip-hop, jazz, contemporary and lyrical. The showcase will also feature an officers’ routine and performances by local dance studios. 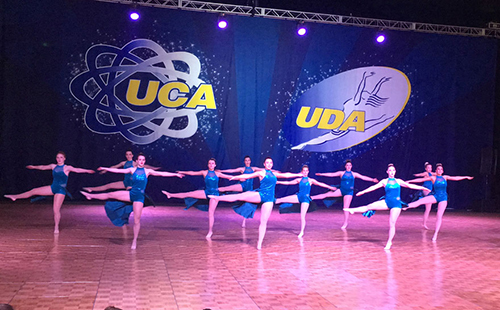 Established at the beginning of the 2015-16 academic year, the team placed first in Dance and second in Hip Hop at the Universal Dance Association’s West Coast Championship in Anaheim, California, earlier this semester. Team members are committed to helping spread the spirit of Dixie State University by performing at school and community events throughout the year. The team is composed of Rylee Colmenero, Rosalyne Feltner, Sydney Garcia, Cora Hamer, Lindsay Hurd, Rachel Hurd, Sarah Lawrence, Rachel Maughan, Montie Peterson, Baylee Stephens, Shellie Stirland, O’Shann Williams and Mikel Young. Tickets for the showcase are $5. To purchase tickets, visit dsutix.com, call 435-652-7800 or pick them up at the DSU Box Office in the M.K. Cox Performing Arts Center. For more information about Dixie State University Trailblazers Competition Dance Team, visit dixie.edu/cdt.